Description: OpenSS7 Project Status Switch. These projects are for components of the OpenSS7 MG stack. Each component is tracked under a separate project. Click on any of the components below to see project information relating to the desired component. This project provides a Media Gateway (MG) Driver that controls the switching of channels on the various OpenSS7 channel driver devices, such as the X400P-SS7, X100P-SS7, CPC-388 and PCA-200E. This project provides an H.248 MEGACO media gateway control interface, in both the MG and MGC roles. In the MG role, the MG driver above provides MG capabilities while the H.248 driver provides communications to a remote MGC device. In the MGC role, the H.248 driver provides a local Media Gateway Interface (MGI) to local call control. This project provides an MGCP media gateway control interface, in both the MG and MGC roles. In the MG role, the MG driver above provides MG capabilities while the MGCP driver provides communications to a remote MGC device. 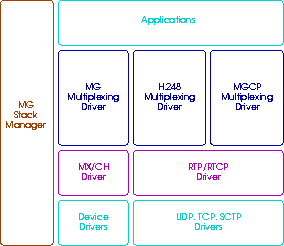 In the MGC role, the MGCP driver provides a local Media Gateway Interface (MGI) to local call control. This project provides a fundamental Multiplex and Channel driver interface to OpenSS7 channel driver devices such as the X400P-SS7, X100P-SS7, CPC-388 and PCA-200E. These channel interfaces can be linked under the MG driver above to provide complete media gateway capabilities. This project provides an RTP/RTCP module that can be pushed or that can link UDP streams to provide a Multiplex/Channel interface over RTP for use by the Media Gateway controller for VoIP switching. The MG Stack Manager is a project to provide configuration and management tools for the OpenSS7 MG stack.